A multi-use balm, 100% natural and packed with moisturising and nourishing ingredients to protect and nourish hard-working hands. Our TLC Barrier Balm is packed with moisturising and nourishing natural ingredients, to protect and nourish hard-working hands. 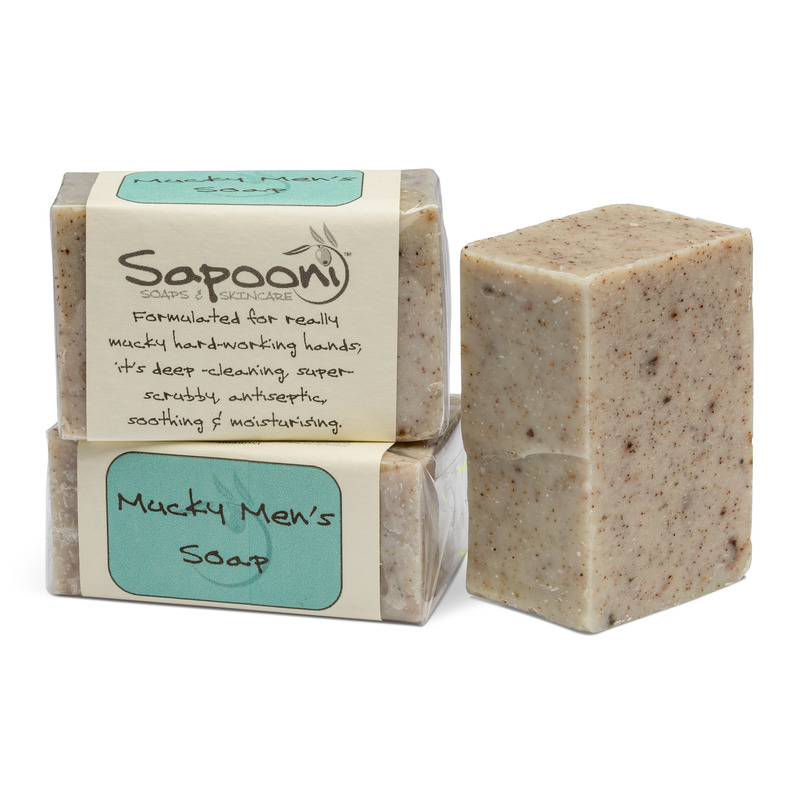 Use as a protective barrier balm before using irritants or working outside, or as an intense moisturiser on very dry skin. 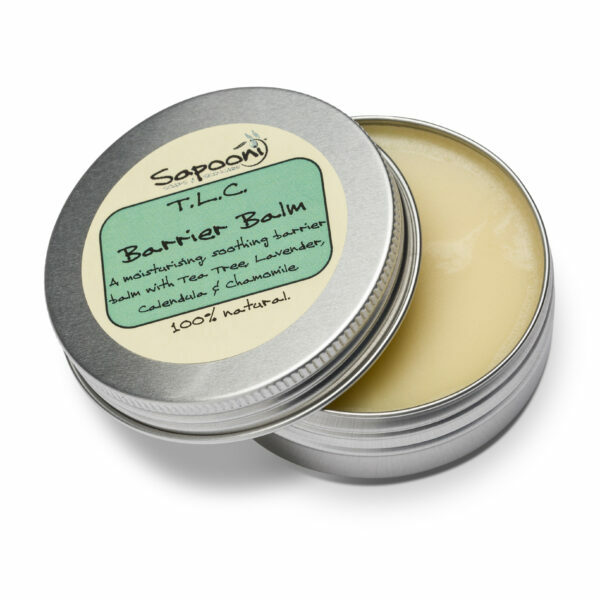 This soft balm will melt on contact with warm skin, and once all the oils and butters have soaked in to the skin, the olive wax acts as natural protection to prevent further moisture loss and prevent irritants from touching the skin. 100% plant-based. We’ve added a carefully selected blend of essential oils chosen for their healing and soothing properties, and nourishing oils including Wheatgerm, Hempseed, Kukui, Vitamin E and Shea and Mango butters. Note; this can also be used to help prevent chafing from running, sailing and other sports. 60g e Aluminium recyclable tin. 100% plastic-free packaging. Lavender essential oil; Used widely in skincare for its calming, relaxing and skin-soothing properties. Tea Tree essential oil; Used for centuries for it’s soothing, calming, healing and antiseptic qualities. It’s also an effective insect repellent. Geranium essential oil; Used for centuries for it’s naturally healing and soothing properties, especially for dry, itchy and inflamed skin. Roman Chamomile essential oil; Used extensively in skin care products, for it’s gentle anti-inflammatory, skin healing properties. Calendula infusion; To help repair damaged or inflamed skin. Arnica; Used traditionally for repairing damaged tissue and to reduce inflammation. 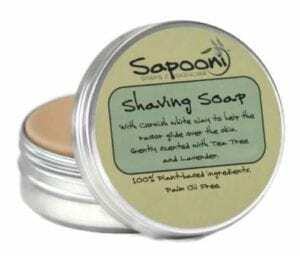 Olive wax; A natural vegetable wax, this protects the skin form the elements, and helps to prevent further dryness and chapping. Wheatgerm oil; packed with vitamins and minerals, this oil is used widely for its anti-oxidant and regenerative properties. Hempseed oil; a light, nourishing oil with a unique blend of essential fatty acids, often used to treat eczema. Mangifera indica (Mango butter), Olea Europaea (Olive oil), Butyrospermum parkii (Shea) fruit butter, Calendula officinalis in Helianthis annus (Calendula infusion in sunflower oil), Cannabis sativa (Hemp seed) oil, Triticum vulgare (Wheatgerm) oil, Oryza sativa (Rice bran oil), Arnica montana oil, Tocopherol (Vitamin E), Lavandula angustifolia (Lavender) oil, Pelargonium graveolens (Geranium) oil, Anthemis nobilis (Roman chamomile), Melaleuca alternifolia (Tea tree) oil. Naturally occurring in essential oils; Limonene, Geraniol, Linalool, Citronellol, Citral, Coumarin. Contains wheatgerm oil and kukui nut oil. Made in a workshop handling ingredients including nuts & dairy. External use only, do not use on broken skin. Avoid sensitive areas such as around the eyes.